Well, how about this? I have blossoms on both of my trees. I also have some kind of disease on one of them, but blossoms! Aren’t they just beautiful? I am now looking for other trees to effect cross-pollination and we’re off to find some horse manure as I’ve read that really gives the plants a boost in terms of fruiting. I am so thrilled. We’ve had them one year and there you have it. 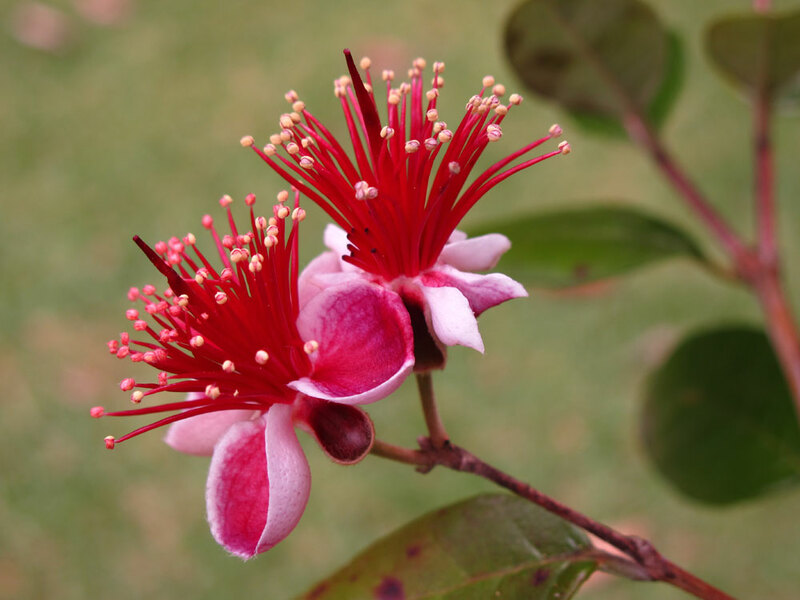 My very first feijoa flower! Another great sounding recipe from the New Zealand Women’s Weekly – this time combining honey, nutmeg, coconut and buttermilk with the deliciousness of feijoa. Heat oven to 180°C fan bake. Grease 12-hole standard muffin tin or line with paper cases. In a bowl, beat butter and honey together until creamy. Beat in eggs and vanilla. Stir in buttermilk then stir in flour, coconut and nutmeg until just combined. Lastly stir in diced feijoas. This slice sounds oh so simple to make – just the thing to whip up for afternoon tea on a cool autumn afternoon when the feijoas are falling from the tree. Or any time of the year, if you’re lucky enough to have some fruit suspended in syrup or lingering in the deep freeze. This recipe comes from the New Zealand Women’s Weekly website. Heat oven to 170°C fan bake. Grease a 17 x 27cm slice tin and line with nonstick baking paper, leaving an overhang on all sides. Beat sugar into melted butter until sugar dissolves. Beat in the vanilla and eggs. Stir in flour and then stir in feijoas. Spread mixture into prepared tin and scatter with almonds. Bake for 45 minutes then transfer to a wire rack to cool. Dust with icing sugar and cut into squares. 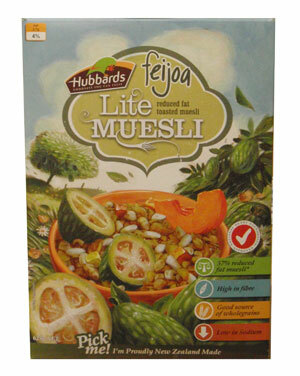 I am not really a fan of muesli – I am more of an oats or toast or eggs kind of gal. 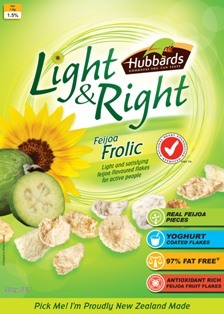 So I don’t want to spend any amount of time pretending that I have tried any of these and love them (I would probably love them more than I love other muesli because they are feijoa-flavoured, but all that puffed rice, puffed wheat and other flakey kind of stuff just isn’t to my taste first thing in the morning.) 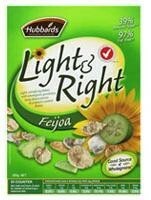 And the real truth is Hubbards don’t export to Australia and I haven’t found feijoa cereal at the local grocery store where my Dad lives in New Zealand. 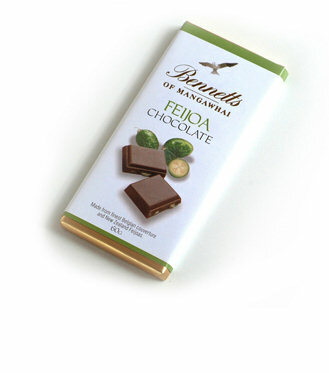 But I admit I am kinda curious, because to kickstart the day with feijoa all year round appeals mightily. So I am really including these here as the first examples I’ve found of box art and packaging featuring the humble feijoa.